Free Printable Veterans Day Crossword. Get the Free Printable Veterans Day Crossword and use at school as an educational activity to teach students about our Veterans. 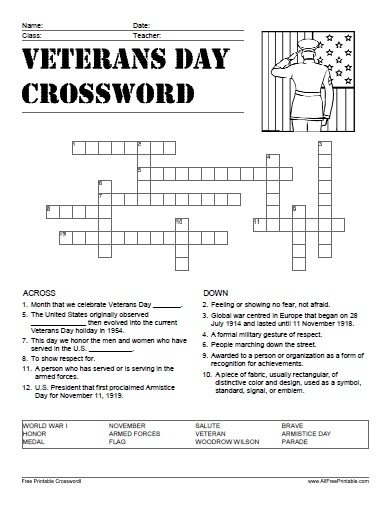 Print the Veterans Day Crossword free and share with students at school classroom. Print it free using your laser or inkjet printer and have fun solving 12 Veterans Day related words. Complete the crossword with words like Armed Forces, President Woodrow Wilson, Flag, Veteran, Armistice Day, Salute, November, Parade, World War I, and many more. Click the link below to download or print the Veterans Day Crossword now in PDF format.